When Proton announced that it made a pre-tax loss of RM4.3 million for for Q1 2005, it explained that it was due to a higher allowance for doubtful debts and higher component costs. Higher component costs have been attiributed to the rising steel prices. But what about the higher allowance for doubtful debts? What doubtful debts are these? Aren’t car purchases financed upfront by the banks through hire-purchase schemes? An industry source sheds some light through Dow Jones Newswire. 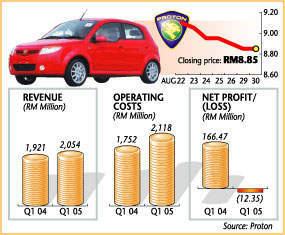 Apparently Proton dealers were persuaded to buy more cars during the quarter to artificially(?) drive up the sales. When these extra cars were taken, obviously the dealers could not pay for them as they do not have buyers yet. Many of these cars did not manage to be sold, and Proton had to write back the sales of these cars as provision for doubtful debts. This is not Proton’s official statement on the provision for doubtful debts figures however, so I think we should wait for an official statement before saying anything.